Alexis and Dex really have a strange idea of foreplay. Alexis gives Dex the cold shoulder because she caught him hugging Amanda and she gave him a peck on the cheek. Dex goes crazy to convince Alexis that it was innocent and totally ignores that he had had slept with Amanda before he married Alexis. Amanda even tells Alexis that is was innocent and that Dex did nothing adulterous. Amanda does give Alexis great news when she tells her mummy that she loves Michael and is going to marry him in a month. Alexis has no time for this. That bit of great news does not deter from Alexis to make Dex beg for it - or just take it. Dex plans a honeymoon for the two and that is the moment when Alexis tells Dex that she cannot because she needs to plan for Amanda's wedding to Michael. Dex hates how his wife just holds onto information and then divulge it at the right moment to manipulate people. As Alexis reminds Dex, he did not marry a fool. Dex has finally had enough and confronts his wife in her bedroom. I guess that should be their bedroom, had Dex not been sleeping in Amanda's bed sans Amanda. Don't all married couples play this game! Alexis accuses Dex of having something with Lady Ashley after seeing the two speak at La Mirage. The accusation ends up in Joan Collins performing in her B-movie greatness. Dex rips her blouse and Alexis demonstrates to Dex that she wants it. And, Dex takes it. Great, they finally are going to get some. Maybe that will end the highly entertaining sniping between the two. Adam's great plan to take over Denver Carrington requires him to make Jeff look incompetent in front of Blake. Didn't this happen over at Colby Co.? Fortunately for Jeff, Adam is not going to try to kill or to poison him this time. No, Adam alters a cable that Jeff was to send to Fred Oates to begin drilling in Louisiana. It was imperative for the drilling to begin right away or else it would cost Denver Carrington millions. Of course, you may wonder why Jeff would wait a day to send a cable or no follow up after sending the cable. Well, that makes too much sense. Besides, it does not give Adam the opportunity to save the day, which he does. Blake is very much impressed by Adam's team player attitude and upset with Jeff for his uncharacteristic carelessness. Adam feels he is in the driver's seat to take over Denver Carrington until Blake questions Adam's "friendship" with Claudia. Blake makes it entirely clear that he would not be pleased if Adam has any sort of romantic involvement with Claudia since Claudia was once Steven's wife. That seems reasonable to me. Of course, Blake knows Claudia is Steven's only hope for heterosexuality. Wow! The gay scene in Denver is kind of lame. Speaking of Steven, did you know that he was still torn between Luke and Claudia? I did not. I thought he made his decision. Then again, it has been a few episodes so we need to get new viewers up to speed. Steven arrives at Luke's place but Luke is not there. Steven immediately believes Luke to be at this gay restaurant/bar (who knows what that monstrosity is) and when he sees him there, Steven immediately walks off. Luke calls out Steven. Steven only wants Luke when he wants him. If Steven really cares, then he should move in with Luke and bring Danny with him. Let's play, "Where's Fallon" circa 1969. Steven is torn. He still loves Claudia and he is going to hurt either Luke or Claudia if he chooses the other. Funny, but it appears to me that Claudia has moved on. Alexis advises Steven that sometimes love requires to hurt others but it is better to love than to not love at all. Jeff still cannot believe he messed up the cable. No worry, Lady Ashley will help him. (An aside, the two look gross together and not because of the age thing, but because Ali MacGraw is a horrible actress.) Lady Ashley once messed up too when she turned up late for a rock concert to take pictures. All Ashley could get were pictures of the crowd waiving to the band as they left the stage. Funny, looking at the picture, you could swear that Ashley arrived 15 years early to the concert (where were these hippies in the 1980s). Jeff looks at the picture and he sees Fallon in the crowd. Great eye, Jeff. Ali Mac Graw is going in for the kill - what the hell is that! Krystle and Daniel feel the best way to let Sammy Jo know that Daniel is Sammy Jo's father is by just showing up in New York City and tell her face to face. Oh, and they don't even bother to tell Sammy Jo that they are coming. Maybe if Sammy Jo had known they were coming, she would not have sought out Rita in a bar and invite her to stay at her place. Rita, it appears, other than being a drag queen, was an aspiring actress with a bad Southern accent who lives with an abusive boyfriend, and has very similar mannerisms to Krystle. Wait, nobody sees the resemblance. 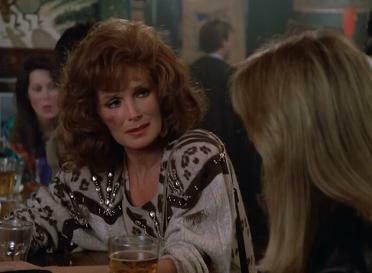 I mean, the minute you see her, you totally see Linda Evans all over her. I guess that was lost on Krystle who actually runs into Rita when she and Daniel go to Sammy Jo's apartment. Daniel did not even notice the similarities (other than a bad red wig). Rita lets Krystle and Daniel into the apartment to wait for Sammy Jo. 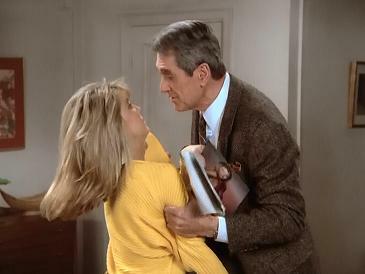 The first meeting does not go well as Sammy Jo acts as herself and Daniel tells her to respect her aunt. Sammy Jo retorts who is Daniel to say something, is he her father. Ding ding ding. Sammy Jo, meet your daddy, and your biological one at that. The two have a more pleasant meal the following day. Unfortunately, Daniel does not have too much time to spend with his new daughter. He has a mission in Bolivia (one which Dex refuses to join). Before going to Bolivia, Daniel gets Krystle to promise him to look after Sammy Jo in case something happens. Daniel really does not know the relationship between Sammy Jo and Krystle - does he. Alexis: Last night must have been a dream come true for you. Alexis: Yes, you've been wanting to sleep in Amanda's bed for some time - too bad she's moved out. Dex: I got the wedding but I never did get the honeymoon. Alexis: In case you didn't notice darling, the honeymoon is over. Dex: The play isn't over yet, Alexis. Ashley: Bought and paid for, Alexis. Alexis: I've never had to pay for it Ashley, have you? Daniel: And you will treat your aunt with a little more respect. Sammy Jo: Just who do you think you are, my father? Daniel: That's exactly who I am.